There are many types of Moths that pose problems in our homes which include the Common Clothes Moth, the Case Bearing Clothes Moth & the Brown House Moth. This is a small Moth which varies between 4-7mm in size with pale straw coloured forewings with no pattern and is common throughout Britain. 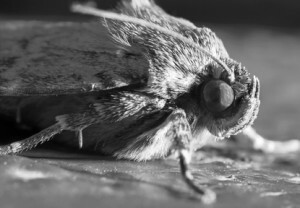 This Moth is reasonably cold-hardy and causes damage to many natural products, especially woven fibres, fur and feather products and fertilisers. This species is similar in appearance to the common clothes moth. The larvae feeds on particles of woollen clothing, furniture fillings, furs and carpets. They spin a silken case around themselves, which is carried around when the Moths larvae move (hence the name) Damage is solely caused by the larvae feeding. The case is off white in colour and is approximately 5mm long. Control of this Moth is similar to that of the Clothes Moth. The adult Brown House Moth is common in the UK. It can grow to a maximum of 8mm and has golden wings flecked with dark brown and black spots. It feeds on dry animal protein, including feathers, hair and wool. Adult Moths lay eggs singly, near to a food source, which the Moth larvae will then feed on 2-4 weeks later (depending on the temperature). The larvae hatch and can take between 2-5 months to develop through to the pupal stage. The pupal stage is formed inside a cocoon and 2-8 weeks later the adult moth emerges. Adult Moths live between 1-4 weeks. Control is similar to that of the Clothes Moth.